← #ArtforGrabs. 2-3 April 2016. CIMB chairperson Nazir Razak said he now thinks he should not have helped his brother, Prime Minister Najib Abdul Razak, to distribute the US$7 million (RM27 million) as reported by The Wall Street Journal (WSJ ), to politicians in the ruling party before the 2013 general election. “I understand the furore, and with hindsight, I wish I didn’t,” Nazir wrote in an Instagram post last night. He also explained that leading up to the last general election, his brother had asked him to “urgently help pass on cash to party machinery”. “I assumed and believed, in good faith, that the funds came from legitimate political fund-raising,” Nazir wrote. He stressed that the entire amount had been fully distributed and he did not retain any of the money. Yesterday, WSJ revealed in its latest expose on 1MDB that Nazir had confirmed receiving almost US$7 million from his brother in his private bank account. WSJ claimed it sighted Malaysian investigation documents, which the US daily alleged indicated that “the majority” of the funds in the accounts originated from 1MDB. CIMB chairperson Nazir Abdul Razak has reportedly confirmed receiving nearly US$7 million from his brother, Prime Minister Najib Abdul Razak. Nazir confirmed to The Wall Street Journal in a written statement that he did receive the sum allegedly in his private account, which he said was later disbursed by bank staff to ruling-party politicians according to the instructions of party leaders. 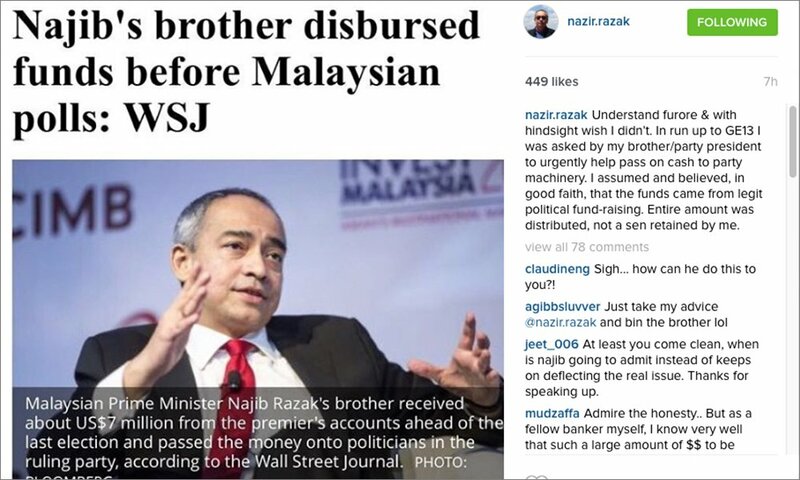 However, Nazir told WSJ, he believed the money was from donations he helped raise from Malaysian corporations and individuals for the elections, and is not sure of any other source of the funds. “I had no knowledge whatsoever that these funds may have originated from any other source(s),” he is quoted as saying in the WSJ report today. “The entire amount was paid out in cash to various recipients according to the instructions of the party (Umno) president (Najib) and the account was closed with a zero balance,” he added. WSJ added that a spokesperson for CIMB declined to comment when contacted. Malaysiakini has also contacted Nazir and is awaiting his response. This entry was posted in Uncategorized and tagged Datuk Seri Nazir Razak, malaysia, najib, politics, UMNO, US$7 political donation, wsj and expose of najib. Bookmark the permalink.